Griots – Mali’s Historians and Musicians | Virginia Friends of Mali Griots – Mali’s Historians and Musicians | Creating and promoting educational and cultural pathways to understanding and cooperation between the peoples of the African nation of Mali and the State of Virginia, USA. In the beginning was the WORD. It is the WORD, kuma (in the Manding languages) that distinguishes Man from other mammals. With the gift of speech came the possibility of articulating needs, then wishes, then affections, and finally developing new thoughts and ideas and beliefs and philosophies. Without words, Men are not men, Women are not women, babies cannot become children. The Power of the Word is magical, and mystical and that power in West Africa belongs to the griots. The European word ‘griot’ comes from a Portuguese word meaning ‘troubadour’ but that is not what the griots are. The Malinké word jeli is close to the word for ‘blood’ jeli or joli (depending on your dialect). The griots then are the lifeblood of culture, the historians and guardians of oral tradition and it is through their words and music than the clans of the Mali Empire learn who they are and what their ancestors achieved. The Mali Empire, one of Africa’s great medieval kingdoms, was founded in the year 1235 by Sunjata Keita, the original Lion King who was forced into exile as a child, and who came back as a young man to defeat Sumanguru The Wicked, the old King of Soso who had killed his father. Sunjata Keita’s tutor and advisor and chief ambassador was Bala Fasé Kouyaté the griot. The griot’s stories of Sunjata’s prowess made the Lion King so famous that even Walt Disney couldn’t ignore him. Kingship requires distance and reserve. An African king speaks softly to his griot, and the griot proclaims the word of the Mansa. The king’s griot is both a minister and spokesman. A king will give instructions to his griot, and the latter will depart on whatever diplomatic mission is required be it to see a local trouble maker, to carry a message of approval, or to visit a distant ruler to negotiate peace … or war. So griots are not mere singers – in fact some never play music at all. The greatest griots are revered as saints because they are also high initiates in the secret initiation societies of the komo and the koreh which gives them power of the word they exchange with the ancestral spirits who may intercede (if they will) with Ngai The Creator. It is the Word that makes us who we are: not the fact that we walk on two legs (instead of four legs); not that we groom our hair and wash our bodies, or take up simple tools such as a rock to break open nuts to eat (for other animals also do these things). No, it is speech that makes us human beings. Ultimately it is the Word kuma that gave men magical power, allowing humans to create families and clans, villages and towns. In the beginning was the Word. Then came the Music. Music whispered through the reeds that rustle along the Nile River and the wind made music with leaves brushing together on trees that grew alongside streams, while cool water contributed a burbling, musical note that created harmonies and allowed Man to discover Music. Probably the flute was the first musical instrument, for shepherds and goatherds heard the music of the reeds, and cut a reed to imitate the wind – and long before men had learned to raise domestic herds, ancient hunter-gatherers heard the music of the reeds and made their own musical imitations of wind and water. Then they tied twisted wheat or millet straw across a calabash and made the first one-stringed instrument, the precursor of the Malian ngoni, the lute, the guitar, the banjo, ancestor of the multiple-stringed cora of the Manding and the sithar of India and the European harp, and the distant ancestor of violins, violas and cellos. Yet even before music, there was rhythm. Music as we know it combines the notes that began with whistling reeds, and the rhythms that come from the sonority of the drum. Africa is a continent of rhythms. The drumbeat of the African soul is rooted in the rhythms of wood and trees and the thunder that echoes around the mountains of Ethiopia during a storm. The quintessential foundation of the African being is a sense of rhythm. Africa’s rhythms infuse the music of America: original jazz, pop, rap and hip hop are direct descendants of the rhythmic sonorities of Africa, while trad jazz, reggae, cajun and soul and swing evolved from the harmonies built by the drums and strings and songs of West Africa and the griots, and then by the descendents of the griots in America. As Peter Szego remarks, some black banjo players in the Deep South trace their musical heritage from their fathers unbroken to their great great great grandfathers in Africa. For it was the griots who took the Word, joined human speech to the rhythms of the drums and the balafon and the music of the pipes, and later to strings: the single string of the dili bo guitar from which jazz musician Bo Diddley took his name; the three strings of the ngoni – direct ancestor of the banjo; and the twenty-one strings of the cora, the West African harp which ripples like cool water running across pebbles. With these tools the griots’ ancestors created the songs and choruses and responses that form the basis of our human, ancient, musical tradition, the underpinning of culture. The special place of griots in West African society resides in their mastery of these essential gifts – elements that transformed a biped mammal into a Human Being. The magic of the Word belongs to the griots. To the magical power of speech, they add the poetry and the music that makes their magic unforgettable. The Word has the power to express love and hate, yet it becomes more magical still when it is transformed into song. The greatest poets of our modern era are the musicians: Bob Marley, Bob Dylan, Joan Baez, John Lennon are the poets whose words moved the twentieth century. Poetry, that supreme achievement of human development, was created in Africa, by the ancestors of the modern day griots. The place to find the greatest griots is the town of Kangaba where the father of Sunjata Keita – the original Lion King – had his capital. This is the heart of Malinké country. Kangaba lies between the Niger River and the foothills of the Manding Mountains. It is the only town on the road that takes you westwards from Bamako, the capital city of modern Mali, to the frontier of Guinea. In a dusty square in the centre of the town you will be shown a small, white hut built of mud brick, with a thatch roof. A series of colorful paintings decorate the whitewashed outside walls, pictures of animals and the instruments of hunting. This hut has stood for more than 800 years: it is the sacred house, la case sacrée of Sunjata. It is cared for by the highest grade of koreh initiates among the Elders of the Malinké nation, the senior griots. What is contained inside that house? Only the initiates can know its contents, for only they may enter the hut. Rumors say that it contains relics of the Lion King himself – his Koran, his sword, his scabbard, his bridle …. People will tell you that every seven years the hut is repaired, re-plastered, repainted, re-roofed and this is done by the combined efforts of all the Keitas from the eldest down the ignorant teenaged members of the First Kafo. The whole ceremony of re-dedication is supervised by the griots. One year I took my family to the septennial re-roofing, to the ceremony known as kaba bolon. I reached that dusty square in the early evening to find it fenced off. Around the inside of the fence, standing shoulder to shoulder, were the boys of the third kafo or age group, those that had passed fourteen years and had recently been circumcised. Each boy carried a long stick and it was clear that they composed a human fence surrounding a Sacred Space and defending its sanctity. Initiation groups are formed every seven years. The name for an age group is kafo and each year has a different name. The first kafo are uncircumcised kids who run around the home with the women. Once a boy reaches circumcision, however, he enters the educational cycle of the komo, which is the society that ensures cohesion and order in society and has been so doing for thousands of years. Each period of seven years brings new challenges for young people to overcome. The kaba bolon ceremony showed me how discipline – and especially self-discipline – is fostered, for the young adolescents had to stand on duty the whole night without falling asleep and without leaving their place in the line. Anyone who faltered could expect a ‘thwack!’ from the senior fourth kafo members who wielded shorter, shorter sticks and who were standing guard over the guards. All night long, the boys stood and the Elders chanted spiritual songs in or behind the sacred hut. The atmosphere was charged with spirituality. Overhead the sky was filled with stars, the Milky Way covered half of the firmament. The chanting drifted across the space. I felt as though I was sitting in a colossal cathedral and witnessing a holy ceremony. And I was! On this sacred night the holy hut stood hatless, its walls freshly whitened and newly decorated. On the ground beside Sunjata’s hut lay a new grass thatched roof for the hut, carefully woven across a lattice of wooden sticks by the next age-group – young men in their twenties who had worked for three days under the relentless supervision of the next senior kafo, the guys in their thirties who had woven the sacred roof seven years previously. People whispered that the roof would rise from the ground the next morning as if by magic, on the command of the griots. No one crawled under that roof while I was there. If there were men hidden under the roof, they were hidden there for at least 36 hours before the roof rose to its place. At sunrise we rose from our sleeping mats and rolled up the mosquito nets. I pushed the children towards a well for a quick wash, and we hurried through our millet-porridge before joining the throngs of pilgrims. Twenty thousand people were crammed around Kangaba’s square, in a town where maybe five thousand people live. We were all waiting for the griots to arrive, for they supervise the ceremony of the reroofing. I knew which lane they would be coming along, so I perched Edward and his friend Naré Keita on a wall from where they would get a decent view. These were mud walls, and scorpions live in the crevasses of mud walls – but I reasoned that any sensible scorpion would avoid a crowd of twenty thousand people and stay in his hole until the hullabaloo died away. I took up a position across the way with my daughter Leila, who was young enough to sit on my shoulders if necessary (or perhaps I should say that I was still strong enough to carry her!). Anticipation is a collective mood. As the sun rose in the cloudless sky, the pot of anticipation moved closer to boiling point. A hush spread through the crowd. I heard chanting. Slowly the chanting grew closer. Then there appeared a line of 22 griots, walking very slowly. I was in the perfect spot to watch the Masters of the ceremony as they moved slowly towards the Sacred Ground wearing the home-woven cotton cloth robes that Malians reserve for sacred ceremonies because – so say the griots – this was the clothing of their ancestors in Ancient Egypt. Each griot carried a stout stick in one hand. In each mouth was a small white chewing stick taken from an aromatic tree. The 22 griots walked seven steps and stopped, turned sideways and chanted. Then they turned forwards again and repeated the process – so that it took the procession fully 20 minutes to move up the lane until the griots reached the square. I huddled a bit further back into the crowd, making a sign with my hand to the teenaged boys that they were to stay put and not to move from their wall. Their eyes glistened with excitement. Naré Keita had spent much of his life in Angola where his father is a Professor of Anthropology. Here he was in the village of his Ancestors, witnessing a holy ceremony under the tutelage of the greatest living Malian, Kela Bala Diabaté. Master of the Griots of Kangaba and Kela and Chief Guardian of the case sacrée of the Lion King. A griot once told me that I should think of Kela Bala’s position in Malinké society as a combination of Archbishop of Canterbury and Chancellor of the University of Oxford. As a fusion of spiritual and intellectual and historical eminence, it would be hard find a more powerful illustration of Kela Bala’s importance and reputation. Kela Bala was also a Muslim, but first and foremost he was an African worshipping Ngai The Creator who was worshipped and revered by Africans long, long before Europeans heard of God or Arabs learned to love and fear Allah. Kela Bala was a Prince of the Ancient Ancestral African Church of Monotheism. I have seen old women bend to touch the hem of his robe as he walked past, in the hope of receiving baraka, or blessed good luck. I had met Kela Bala in his own village of Kela. As an active and helpful parent, I used to take a group of students from the International French School Liberté A each year to hear the historical truths of Mali from the lips of Mali’s greatest repository of history and mystery. I knew Kela Bala as a kind, wise and unpretentious man who was revered by his people. As an international negotiator, Balla Diabaté had settled peacefully many land and border disputes involving nomads and farmers living along the controversial colonial frontiers. Today however, Kela Bala had an aura quite different from normal. The first of the chanting griots was he, and the dread menace of great spiritual power emanated from him. The twenty-second and last in the procession was an old woman. I remembered that women are included in all decision making in this Malinké culture. In the written Constitution of the Empire of Mali, the Kurugan Fuga promulgated in 1235, a space in the Great Assembly the Gbara was reserved for a representative of the women. Women are always consulted before decisions are taken, even if their initiation societies are different. Men stay with men; women share their secrets only with women. The griots finally entered the sacred precinct and the line of Keita boys opened to let them through. Seven times they circled, chanting, around the magic roof before moving their chanting progress towards the case sacrée. Suddenly everything happened very fast. A great shout, the roof rose and raced towards the hut, and all the Keita boys shouted and broke ranks. By the time I had gathered my wits, the crowds were streaming towards the case sacrée to touch the newly-painted walls and the newly thatched roof. I touched them myself, for luck. The ceremony had lasted a long, solemn, all-night vigil, and ended in a joyous rush of celebration. The author was raised in West Africa, and he raised his own children in the Republic of Mali and in the lands of the Mali Empire that once stretched from Timbuktu and the desert to the western Ocean from where Sunjata’s descendent, Abu Bakr II set sail in 1311 to discover the shores of N.E. Brazil. Dr Poulton was Visiting Professor of International Studies at Virginia Commonwealth University 202-2004, and is President of Virginia Friends of Mali. He is writing a book on Peoples of the Mali Empire for elementary school teachers who have this as part of the world history course for 3rd, 5th and 6th graders in Virginia. At the Smithsonian Museum of Natural History you can learn that mammals all have hair, milk and a special bone in the ear. Other animals communicate with noises, or use stones as tools – but only one race has true speech and that is the Human Race. ‘Searching for the Roots of the Banjo’ by Peter Szego in The Old-Time Herald, a magazine dedicated to Old-Time Music Volume 10, Number 4, April-May 2006, p 14-23. The balafon is a wooden xylophone with small gourds hanging below the wooden slats as soundboxes. 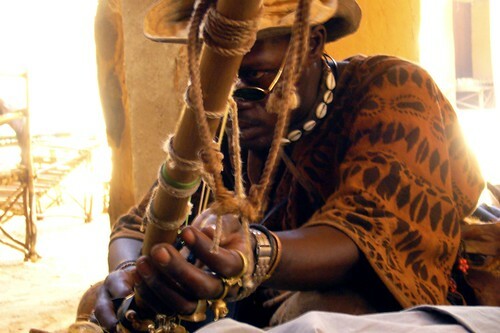 The chief griots of Kangaba are called Diabaté (also written Jabateh, Jobarteh) who live in the nearby village of Kela. They have their own griots, called Diawara (or Jawara: this shows how the British and French colonial influence are still pervasive, because French has no ‘J’). The chief Diawara griot told me that it is his family that keeps the sword of Sunjata. Remember that women in Britain and the United States didn’t get the vote until the 1920s, and in Switzerland women had to wait until the 1970s before they could vote. Malian women were represented in parliament 700 years before American women. Who says Malian women are not valued?